Panch pokhari trekking is non touristy trekking trail in Nepal. Panch Pokhari is named after 5 holy ponds and Hindus religiously respect the place. Panch pokhari lake is just northeast of Kathmandu toward snow wall. The beautiful Himalayan view and pristine nature with district culture is the most attraction of panch pokhar trek. Pristine Mountain views, rich culture and genuine adventure, offering a trekking experience to the base of Jugal Himal towards north east of Kathmandu. Panch pokhari trkking area offers a combination of rich cultural heritage, unsurpassed beauty and biological diversity. Beginning from Chautara, home of Sherpa and Tamang people. Panch pokhari trekking starts from 1,400m and goes up to 4,000m at Panch Pokhari, a seldom-visited pilgrimage site and ends at the Tibetan border Tatopani. Since Panch pokhari trekking ( Ram pahari Trekking operator) trail has been open Himalaya Journey trekking and expedition offers huge numbers trekkers in relevant areas. We take a bus/ private vehicle ride out of the valley and up through the hills. After 5 hours bus ride we arrive at Chautara where we are going to spend the first night of our outdoor adventure right nearby a small town in a ground. Himalaya Journey Trekking and Expeditions trekking guide explains about altitude sickness and all the beautiful sports from where you can see an excellent view of mountains on the very first night. Himalaya journey Trekking and expedition professonal offer panch pokhari trekking accoring to clients holiday schedule and wish. 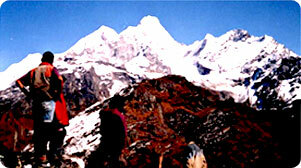 Splendid breathtaking place: Off touristy trekking route and authentic Nepalis life style. Day 01: Arrival in kathmandu 1334m, Himalaya Journey Treks & Expedition’s representative will transfer to hotel , Panch pokhari trekking briefing with officially arrangements. overnight at Kathmandu. Day 15: After breakfast, Relaxing/shopping with own activities ,Himalaya Journey Treks & Expedition’s representative will drop to Kathmandu international airport for onward destination.